Rush are reissuing their 1976 masterpiece, “2112,” on December 18. 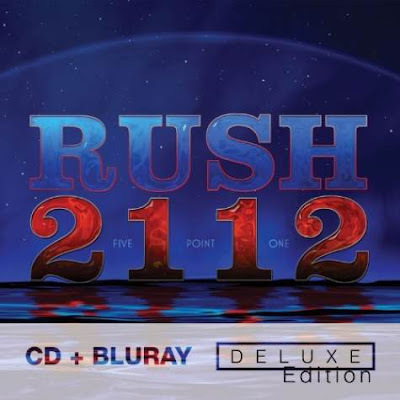 The deluxe editions will feature 5.1 surround sound mixes, unreleased live tracks and the first-ever Rush comic book. The band has revealed the cover art for the new project (see above). There will be 3 configurations of “2112: DELUXE EDITIONS” (CD/DVD and CD/Blu-Ray) and a special “SUPER DELUXE EDITION” (CD/Blu-Ray/Hardbound book case). The deluxe editions contain a CD/DVD or CD/Blu-Ray material including the remastered “2112” CD with 3 live bonus tracks and a DVD or Blu-ray™ disc with a 5.1 surround sound audio mix and an interactive digital comic book, a new album cover by original album designer Hugh Syme, liner notes and unpublished photos.